Write List... brings up a dialog for saving a parsable text file of specifications for the selected items. Write PDB... brings up a dialog for saving the selection as a PDB file. Close dismisses the Selection Inspector, while Help opens this manual page in a browser window. The descriptions in the Selection Inspector are not necessarily the same as the attribute names. If the selection includes multiple items of the same type and their attribute values vary, "-- multiple --" or ">1" will be reported for the attribute. label - a text label for the atom. 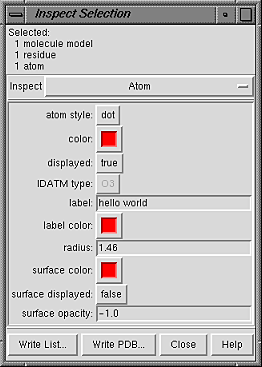 If the atom label was shown using the menu or the label command, standard information (such as atom name) will be shown in this field, but can be replaced arbitrarily; however, showing the atom label again with the menu or label will restore the standard information. color (a color well) - color at the individual bond level (see coloring hierarchy); can also be controlled with the command bondcolor. Note that the color assigned to the bond will only be visible when halfbond mode is off; when halfbond mode is on, the color of each half of the bond matches the visible color of the flanking atom. label - a text label for the residue. If the residue label was shown using the menu or the rlabel command, standard information (such as residue name and number) will be shown in this field, but can be replaced arbitrarily; however, showing the residue label again with the menu or rlabel will restore the standard information. ribbon display - whether a secondary structure ribbon is shown; ribbons are only drawn for proteins and nucleic acids. Protein secondary structure assignments are taken from the input structure file or generated with ksdssp. color (a color well) - color at the individual pseudobond level; see coloring hierarchy. Note that the color assigned to the pseudobond will only be visible when halfbond mode is off; when halfbond mode is on, the color of each half of the pseudobond matches the visible color of the flanking atom. halfbond mode - whether the two halves of a pseudobond are handled as separate entities; when halfbond mode is on, the color of each halfbond matches that of the attached atom. label - an arbitrary text label for the pseudobond. If the pseudobond has already been given a label using PseudoBond Reader, the label will be shown in this field, but can be replaced arbitrarily. If the pseudobond is a distance monitor, however, this label reports the measured distance and cannot be changed.